This is an excellent walk which includes a spectacular stretch of bridleway, a sandy path edged in gorse, and rich woodland. Don't be put off by the golf course and quarry along the way, you are soon past them. You then climb to a quiet lane leading to a 'Conservation Walks Area' where you are free to roam over an open field which is one of the country's, 'Environmentally Sensitive Areas'. This spot has 360 degree views of the surrounding countryside before you drop down to a quiet wood. 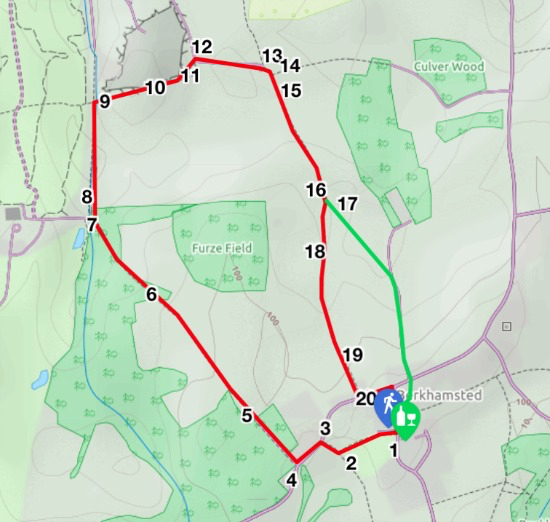 You also follow a picturesque and well-worn path linking Howe Green and Little Berkhamsted, with oak trees that must be hundreds of years old. You can park at the side of the road by the Little Berkhamsted Cricket Club and opposite the Five Horseshoes pub. Enter the cricket field by the gate near the shops at the north end of the ground. Follow the path, keeping the hedge on your right and the cricket field on your left, until you reach an aluminium gate in the corner. Turn right and head for a wooden gate leading to the lane. Turn left down the lane. Just before the lane bends take the first bridleway to the right. This is paved until you reach Danes Farmhouse. At this point it becomes a track which soon ends at a gate leading to a footpath. Continue straight along this sandy path. At this point you have good views to the left across to Bedwell Park. The sandy path continues with gorse bushes on the left and right and good views north across the Lea Valley. The path now drops down through woodland. At this point it can be quite muddy after rain. At the bottom of this hill you pass a small cottage on your left and an outbuilding on your right as the path veers slightly to the left before reaching a gate leading to Bedwell Park Farm. Turn right before the conifer trees, and walk north along a straight path with trees on your left and hawthorn on your right. After a short walk you reach a footpath junction. The path to the left passes over the golf course. 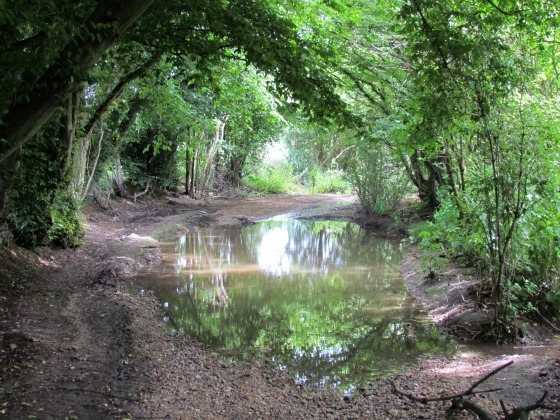 Your way is to the right, across a small stream (this is marked as a ford on some maps). Keeping the quarry on your left, climb east up a sandy path to the top of the hill. Here you will come to a fork in the path, with a step stile to your left. You can go either way as both meet again soon after at a gate leading into a lane. Take the footpath on your right at the end of the lane and head slightly uphill keeping the farm on your right. Here you have an option. Shortly after starting up this path, you will notice another path on the left. A sign describes the spot as 'A Conservation Walks Area'. This is an 'Environmentally Sensitive Area', which is part of a scheme, introduced in 1987, offering incentives to encourage farmers to adopt agricultural practices aimed at safeguarding and enhancing parts of the country of particularly high landscape, wildlife or historic value. It is well worth exploring this field and following the path that leads across it down to Culver Woods. 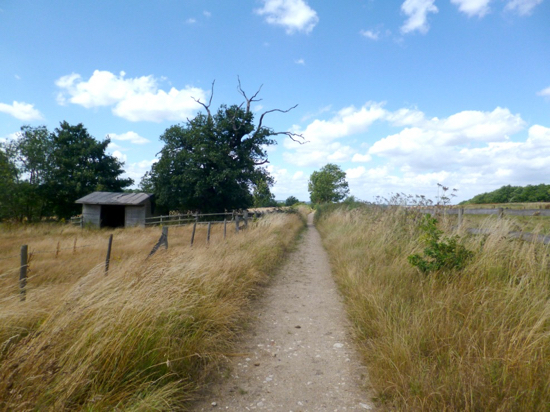 This path offers a wonderful 360-degree view of the surrounding countryside. On rejoining the main route, continue uphill following an excellent path south. You soon reach a concrete footbridge across a small stream. Once over the bridge you come to a post on your right with blue arrows. One of the arrows points straight ahead and the other points diagonally to your left up the hill across the field in the direction of a gate in the distance. If you want to take the diversion take the left fork in the path immediately after the footbridge and walk in a straight line uphill to the gate on the far side. This brings you out on a lane. Turn right and follow it to the village where the lane emerges opposite a path which takes you through the churchyard back to Little Berkhamsted village centre. Alternatively, continue walking along the right hand fork, keeping the hedge on your right and the field on your left. This path can be muddy as the path climbs the hill. Soon the path passes some old oak trees. Continue straight up towards a white metal fence. Slightly to the right of the fence you will find a large wooden gate. Go through the gate and, keeping the brick wall on your right, head straight for another wooden gate leading out into the lane. Turn left and walk back to the village of Little Berkhamsted, where you turn right to reach the cricket club again.